1811 Qing Chinese Qianren Huang Map of China - Blue Map of China! The Blue Map of China - one of the most important and beautiful maps ever made. 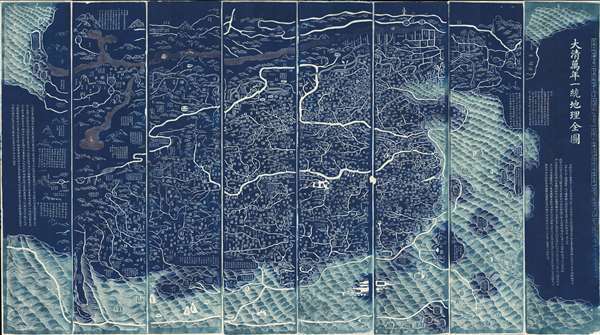 The legendary Blue Map of China under the Great Qing, one of the rarest, largest, and most aesthetically magnificent Chinese maps ever made. Published in 1811 (Jiaqing 16) in the Qing Dynasty, this Chinese map by Huang Qianren (黃千人, 1694–1771) is of utmost significance. Although ostensibly a map of China, the coverage of this map in fact extends to all lands touched by the influence Qing Empire, including England, Holland, Southeast Asia, Arabia, and Africa. As such it can be considered a political manifesto lionizing the unity and majesty of Qing China as well as a functional administrative document. Huang Qianren based this map upon an earlier map (天下舆图) drawn by his grandfather, the Chinese enlightenment master Huang Zongxi (黄宗羲) (1610 - 1695), which he updated and expanded with additional detail and coverage including Jinchuan (part of modern day Sichuan), Tibet, and Xinjiang. Unfortunately no examples of the initial issue survive. The map was reintroduced in manuscript form by Huang Zhengsun in the year 1800 to memorialize the Qianlong Emperor's life and celebrate the coming reign of the Jiaqing Emperor. The 1800 manuscript issue exists in only one example at the Beijing National Library. Afterwards, revised woodblock printings and rubbings were issued to celebrate important moments in the expansion of Qing influence. We are aware of an 1806 printed edition, for example, which we sold previously, and which is the earliest known printed version of this map. The blue edition, as here, was published only in 1811. Other variants, also from 1811, appear in black negative, green negative, and we have heard in rumor only, red negative. The 1811 blue edition is unique and was issued only in that year. The reasoning behind the state reissue of this map is striking blue is not clear. Falling roughly in the middle of the Jiaqing reign, 1811 was not a particularly strong year of the Qing. It was in this year that the White Lotus Rebellion destabilizing northern and eastern Sichuan was fully suppressed. Although the uprisings were defeated, they effectively undermined the myth of Manchu military invincibility, leading to further revolts in 1813. 1811 was also notable for a mass resettling of Han Chinese to the far reaches of the empire in an attempt to stabilize and integrate the huge and diverse border provinces. Both of these factors may have called for a reordering of the Qing administrative tribute system and emphasized a need to reassert and elevate Qing imperial power – thus this map. Color is significant in classical Chinese tradition and it is no mistake that his map appears as such in radiant blue. The blue color of the map, with blue-green highlighting for oceans, may have been chosen to represent the Qing. The traditional term for both colors, or a combination thereof, is 青, which is part of the character used to represent the Qing (清), as in Great Qing (大清). In traditional Chinese iconography blue references immortality, underscoring the 'everlasting' of the Great Qing, as appears in the title. The fact that other color variants exist leads to many questions. Black examples, of which there are few, may have been proofs as black ink would have been a more common if inauspicious color. The green example, of which there is but one known, represents peace and prosperity. Red, if it exists at all, would represent good luck and fortune. An initial examination of the easily recognizable portions of the map suggests an expansive coverage extending from Siberia to Borneo and from India to Korea. Closer examination reveals that this is in fact a map of the world, scaled not in terms of distance, but rather in terms of degree of subjugation to and importance to Qing China. The map is read, like traditional Chinese texts, from right to left, with the most densely detailed regions corresponding to the eastern shores of China. At the far west, in the distant upper left corner, European countries like Holland, Portugal (Land of the Great Western Sea), possibly Italy, Arabia (Homeland of Islam), Africa (Land of the Black Ghosts), the Mediterranean (Little Western Sea), and even the Atlantic (Great Western Sea) are identified. Surrounding the map are textual annotations describing the subject peoples of various regions. The annotations identify not only the people, but the great distances their leaders travel, the great hardships they endure, and the gratefulness with which they suffer, to pay tribute to the mighty and culturally superior Qing. A key to the right of the map helps to understand the map and identify its iconography. Although the translations are our own we are indebted to Richard Pegg, see above, for helping to define the administrative terminology. Sheng – provincial capital – square topped by a rectangle. Fu – prefecture – a square. Zhilizhou – independent magistrate – small house with triangle roof. Zhou – department – rectangle. Xian – district – circle. Guan – frontier station – shaped like a small house. In the key on pre-1811 issues, this icon is missing a roof, but the roofs are present on the map. This omission was corrected in the 1811 blue issue. Guanzhen – meaning unclear – double circle. Through this legend the practical administrative purpose of the map becomes evident. This is how the Qing Emperor would have wanted to see his world. Here Qing power and culture are expansive, extending via a well-run administrative and tribute based tax system throughout the entire empire and beyond. Practical, ceremonial, and administrative needs are thus addressed and magnificently amalgamated into an astounding and influential masterpiece of cartography. The blue and green ink is even, whereas the ink of an engraved map would have signs of brush strokes, and is often uneven. The empty white areas have minute signs of wrinkles / creases typical of a rubbing. These occur as the inked paper dries and pulls and pushes erratically at the uninked paper, which is drying at a different pace. The empty white areas have light remnants of ink, as one would expect to see from the technique and process of rubbing. The appearance of the ink, particularly where blue is superimposed on top of the green, is typical for rubbing, not for engraved maps. The strokes of the characters are smooth and fluid, suggesting that the characters were carved into a wooden or stone plate; whereas engraving would have carved away the area around the characters (with the characters raised above the rest of the plate), so typically the strokes would not be so clean on an engraved map. There is an excellent video on Chinese rubbings put out by the Field Museum that illustrates this process: https://youtu.be/ADfhgDRIhUk. The present example features the uncommon variation of red or brown ink highlighting the Gobi Desert. This would have been accomplished by applying the brown wash to the paper in the vicinity of the Gobi before beginning the rubbing process. 1767 Huang Qianren – no surviving examples. 1800 Manuscript – 1 surviving example in Beijing National Library. 1806 Woodcut Printing – 1 Surviving example. 1811 Rubbing - Blue Map (also in black, green, and possibly red) – Present Example. 1814 Woodcut Printing - Private collection. 1821 Woodcut Printing - Library of Congress. This map typically appears in 8 separate panels, which are referenced in the far right of the map along the edge. Some examples are joined as a single map, others are mounted on scrolls in traditional Chinese fashion. The present example is offered in separate unmounted sheets, as originally issued and is one of the finest examples, if not the finest, ever to come to the market. All in all, this is a rare opportunity to acquire one of the greatest cartographic masterpieces of all time. Qianren Huang (黃千人, 1694–1771) was a Chinese cartographer active 18th century during the reign of the Qianlong Emperor. He was born in Yuyao, Zhejiang, China. He passed the state civil service exam for Tai-an and was awarded a position as a clerk. His grandfather was the great Qing Chinese polymath and 'Father of the Chinese Enlightenment' Huang Zongxi (黄宗羲) (1610-1695), father of Huang Baijia (黃百家) (1643-1709). He is best known for his 1767 revision of Huang Zongzi's map 天下舆图, published as DaQing Wannian Yitong Tianxia Quantu (大清万年一统天下全图)or All-Under-Heaven Complete Map of the Everlasting Unified Qing Empire. Very good. In 8 unmounted sections. Light edge wear. A couple of panels exhbit extremely slight corner loss. Pegg, R., Cartographic Traditions in East Asian Maps, 17-27. Smith, R., Mapping China's World: Cultural Cartography in Late Imperial Times. Library of Congress, Map Division: AACR2: 650; 700/2. OCLC 5681862. National Library of Australia, 26550279.